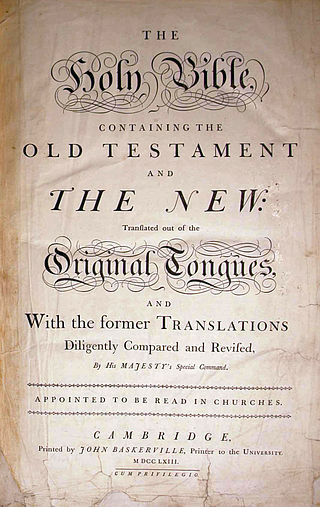 Title page of Baskerville’s 1763 Bible. In 1763, Cambridge University printer and atheist John Baskerville produced a fine Bible. This Bible is known as ‘The Baskerville Bible’. Tis a fine piece of work and not merely because of its contents, but due to the fine clarity of the fonts. The story goes that Baskerville wanted to produce a Bible which people could read with absolute clarity and not those old Gothic type prints that can be found throughout many early English Bibles. The Baskerville Bible was first printed in Folio (Cambridge edition) in 1763. He also printed at Birmingham. His work, although criticized by some, became an inspiration to many, including Benjamin Franklin. John Baskerville died in 1775 and according to his wishes, his body was buried in unconsecrated grounds but his memory lived on. It is believed by many that his name was borrowed by Arthur Conan Doyle for the title of the Sherlock Holmes mystery, The Hound of the Baskervilles. Today, many prints of these original Bibles still exist. Having looked at a good number of these prints in research and devotion, I am thankful to Baskerville for this work and these prints, they are indeed a sight for sore eyes. And inspiring too! Since these days, at least on the surface, atheists appear to be against the Bible and Christianity, but such is not the case with established history. For this version furthered the printing of Bibles for centuries, even to this day. Just goes to show, that God can even use atheists to accomplish His will on earth. This entry was posted on July 7, 2014, 12:55 PM and is filed under Issues with Christianity in England today, new atheism, The Bible. You can follow any responses to this entry through RSS 2.0. You can leave a response, or trackback from your own site.